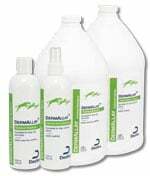 You are buying the Dechra DermAllay Oatmeal Shampoo For Cats Dogs Horses 1 Gallon Each, model #GOSW. At ADW Diabetes, we offer a wide selection of Dechra products for cats and dogs. At ADW Diabetes, we can save you money on all of your pet grooming and health care products. The Dechra DermAllay Oatmeal Shampoo For Cats Dogs Horses 1 Gallon Each is for routine bathing and to promote relieve of dry, itchy, sensitive skin.